The story of Christ like you’ve never heard it before, told through the eyes of the two thieves on the cross and the spiritual warfare hidden from mortal men. The story of Christ like you’ve never heard it before. Told through the eyes of the two thieves on the cross and the spiritual warfare hidden from mortal men. It starts with the temptation in the desert by Satan and ends with Christ’s descent into Hades, his resurrection and ascension. In between, we see Jesus’ ministry in the context of the Biblical motif of Christ taking back the inheritance of the nations from the rebellious Sons of God. The demons that rose up in that day were not random but were evil spirits with a purpose, and part of a comprehensive battle strategy between Christ and the Powers. When it comes to spiritual warfare, Jesus was no pacifist. Now, everything comes to a climax in the arrival of Jesus Triumphant. This book explains why they misunderstood the deliverer to be a worldly warrior king instead of the suffering Servant he was. He was a warrior, but it was a war they could not see with mortal eyes. In Jesus Triumphant, we now see it. 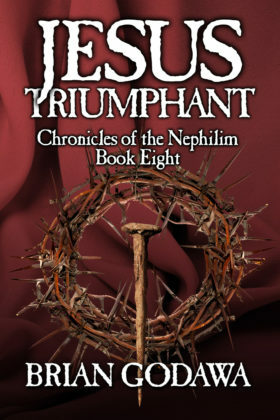 Book 8 of the Chronicles of the Nephilim series. Also available in Young Adult Edition.